Although part of a chain, Bonefish Grill treats seafood with the care it deserves. : This Bonefish Grill was the first Atlanta unit of a St. Petersburg, Florida-founded operation. The large, sleekly designed interior embellished with hardwoods and hand-blown glass lamps makes an attractive background for rather good three-dimensional art. Approaching seafood from a fresh and seasonal perspective, the chain crafts quite decent dishes. Bang Bang Shrimp enfolds wild Gulf shrimp in a tangy sauce. Crab cakes (for an appetizer or main) rely on the singular flavor of lump crab. Scallops are also a good choice. 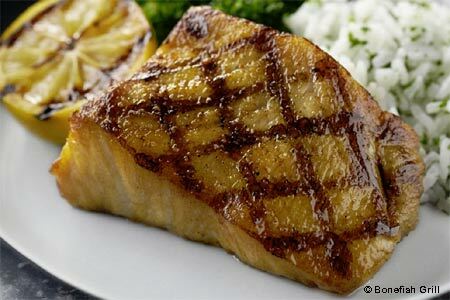 Wood-grilled fish may be ordered in a variety of ways, but the lemon butter sauce respects the flavor of the fish better than any other, although pan-Asian would work well on some of the selections. Pork chops, chicken, pasta and steak are available. Gluten-free options may be requested. For dessert, opt for one of the generously portioned pies. Happy hour runs daily from 4 p.m. to 6:30 p.m. The serviceable wine list is modestly priced if not exciting. Other locations.